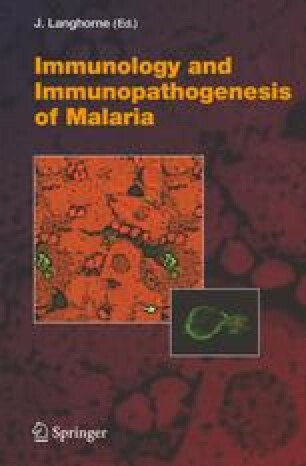 Accumulating evidence provides strong support for the importance of innate immunity in shaping the subsequent adaptive immune response to blood-stage Plasmodium parasites, the causative agents of malaria. Early interactions between blood-stage parasites and cells of the innate immune system, including dendritic cells, monocytes/macrophages, natural killer (NK) cells, NKT cells, and γδ T cells, are important in the timely control of parasite replication and in the subsequent elimination and resolution of the infection. The major role of innate immunity appears to be the production of immunoregulatory cytokines, such as interleukin (IL)-12 and interferon (IFN)-γ, which are critical for the development of type 1 immune responses involving CD4+ Th1 cells, B cells, and effector cells which mediate cell-mediated and antibody-dependent adaptive immune responses. In addition, it is likely that cells of the innate immune system, especially dendritic cells, serve as antigen-presenting cells.Here, we reviewrecent data fromrodentmodels of blood-stagemalaria and from human studies, and outline the early interactions of infected red blood cells with the innate immune system. We compare and contrast the results derived from studies in infected laboratory mice and humans. These host species are sufficiently differentwith respect to the identity of the infecting Plasmodium species, the resulting pathologies, and immune responses, particularly where the innate immune response is concerned. The implications of these findings for the development of an effective and safemalaria vaccine are also discussed.